Sanders Among The Least Wealthy Presidential Candidates : It's All Politics But his congressional salary puts him in the top five percent of income earners. 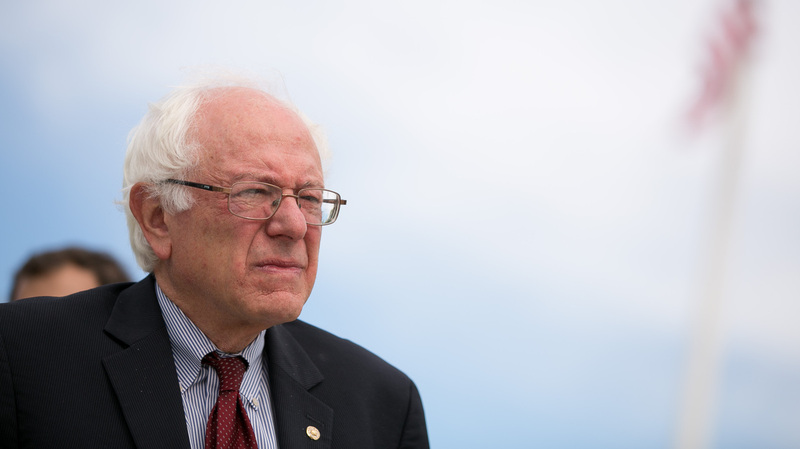 Sen. Bernie Sanders' household took in more than $205,000 in 2014, and paid the feds nearly $28,000 in taxes. This story was first published by Vermont Public Radio. Sen. Bernie Sanders spends a lot of time on the presidential campaign trail talking about the plight of the middle class and the prodigality of the "one percent." Meanwhile, Sanders and his wife, Jane, were likely in about the top 5 percent of American income earners last year, according to copies of their 2014 tax returns obtained by Vermont Public Radio. The Sanders household took in more than $205,000 in 2014, and paid the feds nearly $28,000 in taxes — an effective rate of about 20 percent based on Sanders' taxable income of $141,000. That means they likely earned more than 95 percent of Americans, according to the most recent data available from the U.S. Census Bureau. Sanders had an estimated net worth of $330,000 in 2013, according to financial disclosures filed with the U.S. Senate and analyzed by the nonpartisan Center for Responsive Politics, a watchdog group that tracks money in politics. But that's a relative pittance on Capitol Hill, where the median net worth for a member of Congress topped $1 million in 2013, according to the Center's analysis. In the Senate, Sanders is downright poor: the median there was about $2.8 million. "Congress is a special, elite set," said the Viveca Novak, the Center's editorial and communications director. "Most members of Congress are millionaires." And Sanders is pretty poor by senatorial standards, Novak said: Based on his 2013 financial disclosure forms, the independent ranked as the 86th richest member of his chamber. The Sanders' earnings also dims in comparison to the money raked in by his top rival for the Democratic presidential nomination, Hillary Clinton. The former secretary of state and her husband, former president Bill Clinton, made more than $25 million in speaking fees alone between the start of 2014 and mid-May of this year, according to financial disclosures. "He's pretty close to the bottom" among presidential candidates, Novak said. "I don't know if there's any major candidate who has a smaller net worth. I mean, you look at [Republican] Jeb Bush, and Jeb Bush last year made about $8 million. So there's a pretty big disparity there." The biggest chunk of the Sanders' income last year came from the senator's $174,000-a-year congressional salary. (His occupation, as noted on his federal return: "Government Service.") Sanders' presidential campaign spokesman, Michael Briggs, explains the Sanders took in another $39,281 from Social Security benefits; $4,982 from the senator's Burlington mayoral pension; and $4,900 from Jane Sanders' governor-appointed spot on a low-level, radioactive waste commission. One unanswered question raised by the returns is the breakdown of the Sanders' $56,377 in itemized federal deductions. The Sanders donated $8,350 to undisclosed charities, Briggs said. But the campaign declined to release any more information about the deductions. Meanwhile, the Sanders household doled out $7,903 in Vermont state income taxes, and gave $150 to state programs benefiting children, the environment and veterans, according to their state tax return. And, yes, the self-described "democratic socialist" who supports publicly-funded presidential campaigns did put his money where his mouth is: Both the senator and his wife checked off those little boxes on their federal tax return, thereby sending $6 to the cause.